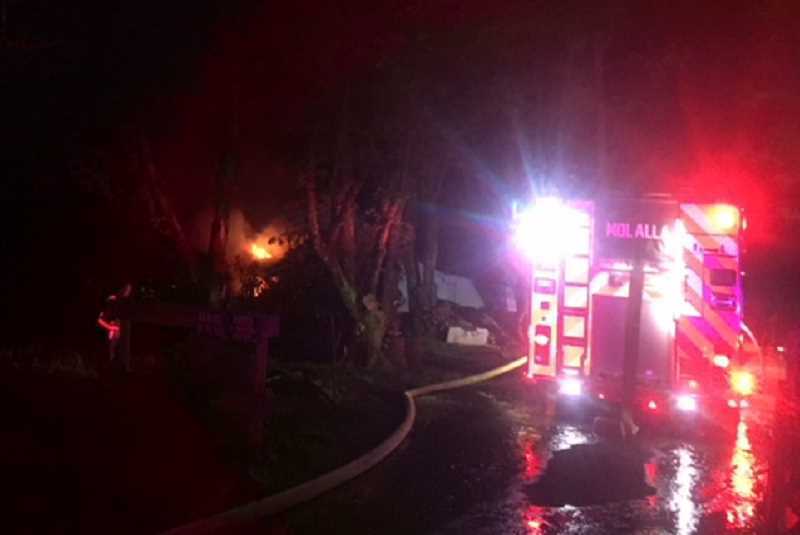 An early morning blaze left a home in ruins early Monday along Sawtell Road just outside of Molalla. The first call came about 1:40 a.m. for a fire in the 30000 block of Sawtell Road. According to Canby Fire's Todd Gary, when crews arrived "we had heavy flames coming from the front of the house and from the roof." While everyone in the home got out okay, one person did suffer non-critical type burns, which required treatment at Emanuel Hospital in Portland. "Eventually, a second alarm went out due to a lack of manpower," said Gary. Crews form Woodburn, Clackamas, Colton, Molalla and Canby descended on what Gary estimated to be about 1,800-square-foot home to fight the blaze. There were some challenges in battling the fire, said Gary. The home was about five miles outside of Molalla and there were no fire hydrants in the area. "So we did have to bring water tenders in from Colton, Molalla and Canby," he said. "We used about 9,000 gallons of water to put the fire out." Gary said that the cause of the fire is still under investigation, but that "the fire did come out of one of the bedrooms, but other than that we don't know what it is that caused it." The home is considered a total loss.